Non enveloped virion, about 27-30 nm in diameter with an icosahedral symmetry. Linear ssRNA(+) genome of about 5.5 kb. Encodes at least a capsid protein and a RNA-dependent RNA polymerase. The virion RNA is infectious and serves as both the genome and viral messenger RNA. The viral RNA is translated to produce the RdRp protein. Translation of the capsid protein. 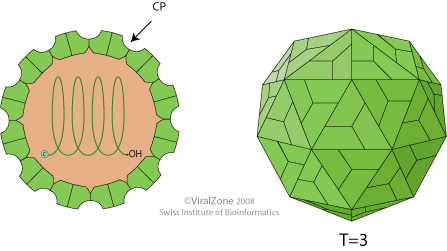 Virus assembly in the cytoplasm . Release of infectious particles (lysis? ).